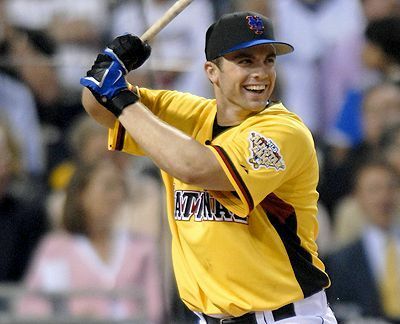 2006: David Wright made his first All Star appearance during the Mets NL Eastern Champion 2006 season. Wright got the start alongside Mets team mates Paul LoDuca & Carlos Beltran. Jose Reyes was also elected to the team but sat due to an injury. 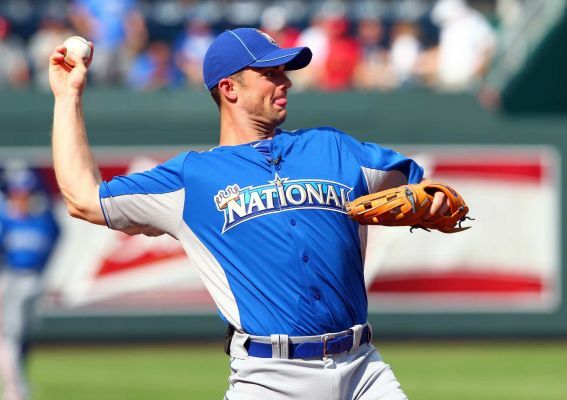 Wright was involved in the All Star HR Derby that took place the day before the game, with LoDuca throwing him the pitches. Much was said that the Derby ruined Wright's swing in the second half of the season, as his production at the plate fell off. The 2006 All Star Game was held in Pittsburgh's beautiful PNC Park with the AL taking a 3-2 win, as Texas' Michael Young tripled off the Padres Trevor Hoffman, in the 9th inning, scoring Troy Glaus. To the delight of the Mets fans, Wright belted a solo HR off Detroit's Kenny Rogers in the 2nd inning, putting up the first score on the board. Wright drove in the only NL run of the night, as the only other scoring came when Rou Halladay threw a wild pitch to Albert Pujols, scoring Carlos Beltran from third base in the 3rd inning. As for Wright, he then grounded out twice in the later innings, going 1-3. 2007: The 2007 All Star Game was held at San Francisco's AT & T Park, with the AL winning another close one 5-4. Wright, Reyes & Beltran all started for the NL with Billy Wagner also making the squad. With the AL ahead 3-2 in the 8th inning, Wagner allowed two run HR to Cleveland's Victor Martinez. In the 1st inning, the Mets; Reyes singled stole second & scored on Ken Griffey Jr.s base hit. David Wright grounded out to end the inning. After grounding out in the 4th, Wright then singled in his last at bat in the 6th inning off Justin Verlander. That season Wright hit a career high .325. 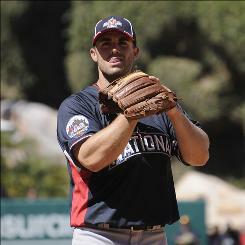 2008: David Wright was elected to the 2008 All Star team but did not start in favor to Chipper Jones. Once again Billy Wagner joined Wright representing the Mets, it would be his last All Star game in a New York uniform. The game was a four hour & fifty minute, 15 inning game held at the old AL New York's ball club in the Bronx, with The Rockies Clint Hurdle managing the NL & Boston's Terry Francona managing the AL squad. The game was won as Texas' Michael Young hit a sac fly off the Phillies; Brad Lidge, scoring Justin Morneau in the 15th inning. The winning pitcher was former Met prospect Scott Kazmir. Wright went 1-3 in the game, pinch hitting for Albert Pujols in the 8th inning. Wright singled off George Sherrill to lead off the 13th inning, but was forced out at second base. He then drew a walk in the top of the 15th inning, but was left stranded on first base. He finished that year with career highs in HRs (33) RBIs (124) & matching his career high in doubles (42). 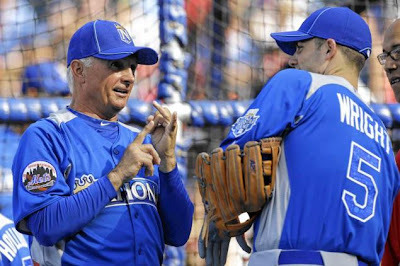 2009: The 2009 All Star Game was held at the new Busch Stadium in St. Louis, as Tampa's Joe Maddon led the AL to their seventh straight win over the NL. In the bottom of the 2nd, Wright got a base hit off Toronto's Roy Halladay. He got to second on Shane Victorino's single, then scored on Yadier Molina's single to center. In the 4th, Wright struck out looking against Kansas City's Zack Greinke , before getting removed from the game. 2010: Wright got his fourth start in the 2010 All Star Game at Angels Stadium in Anaheim. The NL All Stars broke their losing streak & started a three game win streak of their own. In the 2nd, David Wright got his first at bat, getting an infield single off Tampa's David Price. 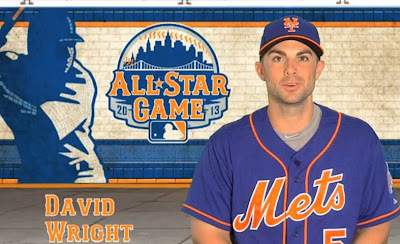 In the 5th, Wright singled off Detroit's Justin Verlander, his second All Star Game hit, off Verlander. David got to third but was stranded there, before getting removed from the game. In the 7th with two outs, Atlanta's Brian McCann doubled to right field, clearing the bases putting the NL ahead for good 3-2. 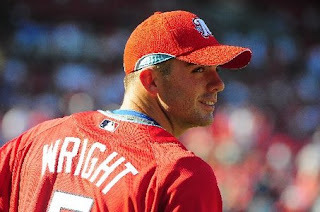 In 2010 David Wright drove in over 100 runs for the fifth time in his career. 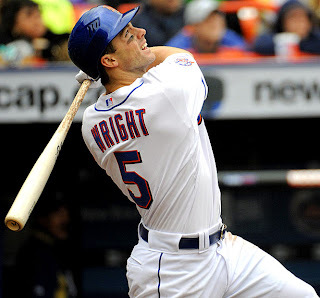 2011: Wright missed the 2011 Mid Summer Classic due to an injury, as he had his worst overall season batting just .254 with 14 HRs 23 doubles 61 RBIs & a .345 on base % in just 102 games. 2012: In 2012 David Wright did not get the start, as the fans in San Francisco stuck behind their third baseman Pablo Sandoval casting multiple votes. At the break, Wright was batting .351 with 11 HRs & 59 RBIs. Sandoval's numbers weren't as good; batting .307 with 8 HRs & 30 RBIs. Another Met getting subbed was pitcher R.A. Dickey who was . NL Manager Tony Larussa, went with San Francisco's Matt Cain who was 9-3 with a 2.53 ERA. The All Star Game returned to Kansas City this year, where the NL beat up on Ron Washington's AL team 8-0. Wright entered the game in the 5th inning & went 0-2.